This is a powerful card and possibly the greatest manifester in the deck – being a 10 it is the end of the suit of disks, and the corresponding position on the tree of life (Kabbalah) is Malkuth – the place at which the physical universe is manifest. Disks is the realm of the physical too so there is a double reference to things being physical and concrete in the world. It is connected to Mercury in Virgo. Mercury rules Virgo and so these two are happy together, the energy of mercury bringing the energy of manifestation, creation and change into direct experience. Mercury brings energy and movement to skillful, attentive Virgo so we can use money wisely with this card. This card is also the last of the whole series of steps of manifesting spiritual reality into earthly form through all the pips cards starting with the Ace (Kether) of wands – where all is possible and going through the realm of spirit (wands), thought (swords), emotion(cups) and finally earth(disks) to come into being. The next step once this is achieved is to start again with a new manifestation so the 10 disks also takes us right back to the ace wands again with all its potential. 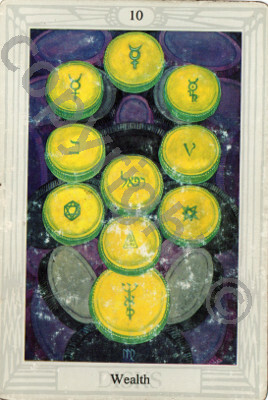 On the card are 10 disks arranged in the shape of the tree of life with the biggest disk at the bottom indicating the importance of this position in this card – the home of the 10 Each disk has a different symbol on – but they all are correspondences to Mercury – excepting the symbol at Hod on the tree of life (lowest coin on the Left hand side) This position is connected to Mercury anyway and the symbol here is the Sun, there is the implication here that the wealth and created things must be used and kept moving in order for more to continue to flow otherwise the 10 here becomes a stagnation and low energy card rather than one of continued wealth. The sun’s energy helping to keep things moving. So we are warned against greed and clinging to the wealth we are receiving. In many ways when this card comes up it is telling us that we have all the wealth we need both financially, emotionally and inner skills, but that we must use these with skill and precision in order to keep things moving, allowing the energy to continue to flow rather than to stagnate in a pool. It is very much a time to get out there and show the world your riches on all levels and use them to make the world, including your own, a better place.